Oh, Dell. I thought since Jeff kicked you around the block way-back-when, you had learned your lesson. I thought you had changed. But here you go, breaking my heart again. I won’t bore our readers with the full saga. But the sketch, for those joining our drama late: after our long talks about my lemon of a XPS 1330, you finally agreed to send me a “refurbished” XPS 15 just a few months ago. It had trouble from day one, which your phone support suggested was likely faulty memory. Weirdly, with 15 month old boys and a business to run, I was a little busy and didn’t have time to lose with another round of let’s-try-to-fix-it, so I lived with it. Until this weekend: when the XPS 15’s hard drive hard crashed, and took some of my data with it. So yesterday, I had a nice talk with one of your folks, which took about an hour, at the end of which I was promised a response in 24-48 hrs about receiving another replacement system, and an email documenting the call. Didn’t get the email: first bad sign. That’s a direct quote. Sorta-kinda journalist, you know, I pay attention to such things. Excuse me, I said? Did you just say you don’t buy my explanation? As in, like, um, you’re saying I’m lying? “I’d like to speak with your supervisor, please” I said. And then… the line went dead. Yup: His Manager-ness decided to hang up on the (justifiably) irate (but polite) customer rather than have his boss hear about how he called said customer a liar. So the good news for me is I’ve got a backup computer, and I’ve got Twitter, a blog, Facebook, and now… motivation. But Dell: none of this, I’m afraid, is good news for you, sweetie. As a social media guy, I of course know Dell’s history with Mr. Jarvis and I hear tell they’re a bit more on the ball about such things these days. This won’t exactly be a hard test, but let’s give it a go, shall we? When someone from Dell who can be civil and won’t hang up on me would like to talk about the Dead Parrot system above (service tag 8L0B6P1), drop me a line at rob – at – neppell – dot – org. Clock starts now. Ready, set: go. Update 7:13 pm: Welcome, Instapundit readers! Now, Dell, hon: Glenn has gone and made this game hardly much of a challenge at all (thanks, Glenn!). This would be the social media equivalent of tossing aside the flare gun as an inadequate signal for help and lighting the entire forest on fire instead. You should more or less be able to see this particular pebble rippling across social media from orbit at this point. So my now-best-buddy manager that I spoke to a few minutes ago is on the case, and indicated he’s attempting to get the “highest escalation authority” involved. Anybody want to give him a hand and move this ball along a little faster so we can all move on with our lives ? Update 9:00 pm: So this has become, obviously, about more than a laptop. It’s about how companies interact with their customers in a social media world, and that happens to actually be my business. So the intriguing thing about this incident to me is that in five years or so as a social media “professional” and a bunch before that as an enthusiastic amateur, this is really the first real world example that’s smacked me in the face personally that I could observe and comment on directly. So, then: this is no longer just a customer support issue. It’s a tutorial! Class is in session, folks, so let’s talk about what should be happening around Dell right about now. First, let’s be clear that in terms of social media monitoring and response, Dell’s resources are effectively infinite. By which I mean, the sum of money it costs to get absolutely top-flight social media monitoring is more or less a rounding error to Willy the Mail Boy’s expense account budget for a company the size of Dell. This is most certainly not the case for smaller businesses, nonprofits, and the like, but Dell is a Big Boy and as such they should be playing with the pros when it comes to social media. So: I first started Tweeting my displeasure with Dell over three hours ago, and posted three Tweets total. I even used the #dell hashtag, making it utterly trivial for Dell’s social media team to pick up on my comments (and utterly inexcusable if they missed them). I then followed up with the blog post you’re reading now, which was soon linked by Glenn, who is of course a gentleman, scholar, and damned snappy dresser, aside from being a good friend who knows a fun story when he sees one. That second part — who am I and how much attention can I draw — may seem a bit, well, anti-democratic or something. But the reality is, from Dell’s perspective, they should be assessing whether I’m someone with a voice that will be heard, or… not. Ideally, you give all of your customers top-notch service, but back here in reality, you ultimately have to prioritize resources. These days, if you’ve got two equally deserving customers, one with a major social media presence and one with none, you’d be foolish not to address the former before the latter. For myself, I do feel a slight twinge having taken a whack at Dell like this: have I used my social media powers for evil and not good, finally? But the answer is no, I don’t think so. I’m fortunate to have reached a point where, when I need to, I can draw serious social media attention to an issue — if that issue is real and legitimate. In terms of doing so for personal reasons, I think I can actually say this is the first time I’ve ever done so. But the thing to recognize about whatever “power” I may have in social media is this: the fact that out of all their customers, every now and then one of them will turn out to be somebody like me is what keeps Dell — or any business — honest. If I make a big deal about the shoddy treatment they’ve provided me and light up the social media world for a brief moment with the dim glow of their stupidity, then that will make them institutionally more cautious the next time a customer has a beef. It’s just good business: when you don’t know which customer might have that nice big social media megaphone, you have to assume that every customer might. So here we are, four hours in. The key question is what will happen on the overnight: it’s entirely possible that Dell’s social media folks are all over this and even ahead of my recommendations, but I don’t know because they (sensibly) aren’t going to try to call me at 9:30pm local time. By tomorrow morning, though, we’ll have the answer to the key question: did Dell really learn the lesson Jeff Jarvis taught them many moons ago? Are they paying attention? Or do they need to be taught it once again? Day Three, 7:48 am, : Aha, so the social media team is on the case. @dellcares followed/Tweeted me at 1:30 am PT. Sadly, they requested my service tag, which means they didn’t actually read my Tweets/this blog post, as you can see it’s noted above. So we’re still at canned response level, I’d guess: they saw a negative Tweet and send a “can we help?” without actually reading all the info — as seems to be the process — , which is better than nothing but still minor leagues at best. 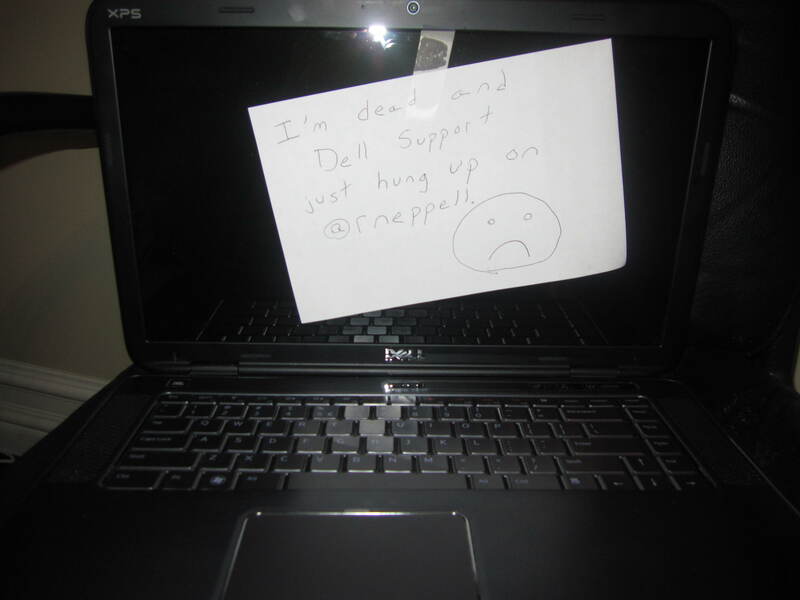 And about an hour ago, @dell itself Tweeted me, noting “@rneppell Just saw your tweet… sounds like a horrible experience. Yikes, sorry to hear that. 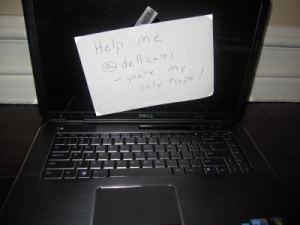 I see my buddies over @DellCares tweeted you.” Which I guess is kind of nice, if I was looking for emotional support. But I’m not really sure what it was meant to accomplish — other than invite me to reply and re-link to this blog post, thereby keeping my issue fresh in the Twittersphere (i.e., not an obviously helpful move from Dell’s issue management perspective). (In case you’re wondering how we’re counting, I’m calling this Day Three as my first extensive conversation with Dell was Monday morning — that’s the one that mysteriously vanished down the memory hole. If I was being really bitter, I’d call this Day Five, as the system crashed Saturday). Day Three, 8:36 am: Exchanging a few tweets with @dellcares, who indicated they’ll have a tech call me and also asked me “For your protection, please remove post containing personal information”. By which they clarified to mean my service tag above. I do not think it has fully sunk in yet that even if I was paranoid enough to worry about my service tag as “personal information”, I do not intend to be in possession of that laptop for very much longer. Day Three, 9:26 am: Oh dear. This is worse than I thought. So after @dellcares said they’d have a tech call, I emphasized I didn’t need a tech, I needed someone with authority to approve a replacement. @dellcares said “Understood, the Tech has authority to fully assist.” So I just spent fifteen minutes on the phone with Dell tech who called, and she made quite clear that she could only approve a replacement hard drive, and in fact did not have the authority to approve a system replacement (or refund). She did, however, very helpfully offer to send me a an email link to the Dell policy explaining why that’s all I deserve, so golly, that was nice. I’ll have to block out some time later today to curl up with that; I really needed some good reading material. Day Three, 10:04 am: Good news, as even I found the last update depressing — the tech I spoke to was NOT the one dispatched by @dellcares, so my comments above should be disregarded with respect to them misleading me. (Not really my fault, though, as I told that tech @dellcares said they’d send someone with full authority and she didn’t correct me. We ended the call with her assuring me this was it and I’d get no further calls / different answers, and me assuring her that she really didn’t get it). But good, means at least part of Dell hasn’t entirely lost its mind. @dellcares indicates their tech called me a few minutes ago and got voicemail (true, just missed grabbing the phone) and so waiting to connect with them now. 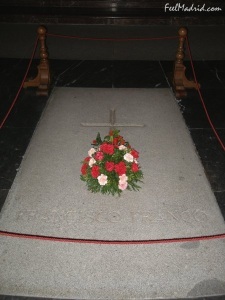 Day Three, 10:17 am: THIS JUST IN: Generalíssimo Francisco Franco is still dead — and so is my laptop! . Day Three, 11:22am: Just got off the phone with one of the special @dellcares social media team reps, and we appear to be making progress (slowly). Dell is now committing to providing a new (not refurbished) replacement system. (Yay!) But, the rep indicated that it would ship in about a calendar week (Boooo!). I explained that to me, this meant they clearly still weren’t taking this issue seriously — after all this, they expect I’ll be happy to stare into the cold dead screen of my defunct system for a week or more patiently waiting? The process, he said, usually it takes even longer but we’re expediting to get down to that week, blah blah blah. I pointed out that if Michael Dell walked into his office and said “Send someone to the production line, grab a new system that meets or exceeds his specs, and put it out FedEx Priority Overnight today” then that would happen — and it wouldn’t even be that hard. Shipping computers is, after all, kinda what they do. Day Three, 6:38 pm: Progress. Dell — and in particular, the superspecial @dellcares team — has committed to shipping me a new (not refurbished this time) system to replace the dead one. They unfortunately still insist that it could take 8-10 business days, which is maddening and I remain baffled by. But they did (eventually, after I reminded them of my time wasted and the history of this situation) agree to one particular upgrade that I specifically requested (and the overall system they’ll ship is an upgrade from the current one). I should in theory have an order number / real confirmation in the morning. So as I pretty much knew all along, the ultimate outcome of this issue looks like it will be a reasonable one. But the process — oh, the process. But we’ll wait and see, and a full debrief / after-action report will be forthcoming. But as a preview, let us ponder for a moment how many times things I was assured by Dell reps Could Not Be Done are now, in fact, being done. Life’s full of possibilities when you open yourself to ’em. And let us also ponder the time wasted in trying to avoid an outcome (a non-refurbished new system being provided to me) that was fairly obviously inevitable from the start. I know I’ve spent at least four hours on the phone. At this point I’d guess there have been at least ten Dell employees directly involved in this case. As I say, we’ll do a full debrief when we’re Done, but do begin the pondering of the cost of those employees time, plus the cost to Dell’s reputation given the visibility I’ve shown on this issue, and begin to weigh it against the cost of a new laptop (and remember to weigh it against Dell’s cost, not the price they sell it for). Dell’s systems are made to order unless you buy pre-configured retail so it makes sense that it would take 8-10 days to get a new system built. Sounds like @dellcares came through for you. Amy: I know, JIT and all that. But surely there’s some oversupply built into the process? And if not, why not? I’m fairly sure that Dell pre-builds certain configs and then markets them as “ships today” occasionally, so why not offer me one of those? If their JIT process is so absolutely rigid that not even Michael Dell could make a system go out the door same day… well, I think the argument makes itself. That’s way too rigid a process. They do have systems in retail they could have probably offered but those are pre-made and may not have been exactly what you are looking for. Dell is known for is the build to order model which is why it makes sense that it would take time to get to you. At least you have a back up way to be online while you wait. I used to be a solid Dell customer, Laptop, desktops, the PDA, you name it I had it, all top of the line. Til I went thru the same problems you are having, plus the fact that they outsourced to a, shall we say, not very friendly to females country. It *never* occured to me dealing with in-house CSR’s, but if I had one more “You are a woman, what do you know” BS response (I’ll tell you, dearie, I have a degree in computer science, that’s what I know) from Dell’s cube farm, I was going to scream. So, no, no more Dells. Ever. I love this story and the implications it carries for Customer Service for so many industries. However… the webcam is down. Booo. Oh noes! I just went to the live web cam of the dead dell and it too is dead! Did Dell provide the webcam as well? We used to have a Dell call center here in town; horror stories from the employees were legion. Stories like this renew the horror on a fairly regular basis, therefore, I’ve never owned, and never will own, a Dell. Amy: On the point of them having some configs on hand, that was pretty much the argument I made with them. If they had a system ready to ship overnight, I wouldn’t have quibbled (much) about the config. But once they said 8-10 day wait for a build, I said “well fine, but if you’re going to make me wait for the build, then build it to what I request”. They balked initially (they had already provided some component upgrades; I asked for one more in particular) but within a few hours agreed. Still waiting for actual order number / final confirmation, though, so we’ll see. I admire your sense of humor through all of this! The problem with Dell is this is how they deal with everyone and most people give up. Also Dell obviously only pays attention to people who they realize can bring attention to the cause. I’ve had a similar issue but I am a nobody and they have agreed to a new system only after I emailed michael@dell.com but they are saying they are canceling my warranty and the new system will have none. Now they don’t want to call me back and yeah they never emailed me either even though I asked. Here’s hoping FedEx and Dell are good to you today.